Buck pocket knives are an American classic, the evolutionary result of a Kansas blacksmith's search for a better tempering method, about a hundred years ago. Now that stainless steel has taken over the market, tempering probably isn't the pinnacle feat of the industry any longer, but back in the days when every little town had its resident craftsman of iron and steel, everyone tried to be a step above the rest. Whether Hoyt Buck discovered anything special in terms of tempering is in doubt, but he made a good knife, starting out as many have, reworking old files into new blades. The Buck knife has a reputation for consistent quality and durability, with blades and construction that are just heavy enough to be noticeably different. I've often wished that a sheath came with them, because they feel a little too large for your pocket unless you work on a farm. The Buck knife has the heft of a good tool. Materials these days are updated, but visually the knives are much the same as they were fifty years ago when wood or stag handles were the norm. 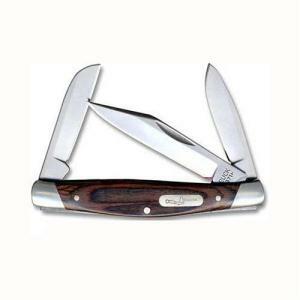 The 371BRW Stockman is typical of the company's modern products, stainless steel blades and a "wood grain" handle. The handle material is actually a composite called Micarta, with the look and feel of polished wood but considerably better durability. Three blades in three styles are more than you'll need even if you break one trying to turn a screw; the lifetime warranty won't cover the blade you broke doing that, but if there's anything wrong that's the company's fault you can always get a repair or a new knife. I've never had reason to test the warranty; the knives are always stout enough to last.